Wednesday was July 4th (U-S-A! U-S-A!) and it was another 3:10 game. I usually like 3:10 start times because you’re home at a decent hour (I’m old). It was a different story on Wednesday though, because it was going to feel like 100 degrees at times, and it did. I left Fort at 12:20 and picked up Victoria (my girlfriend for you newbies) in Johnson Creek at 12:45. We got to the Cooooooooper Lot at 1:25 and I walked around telling people about Be The Match, and Victoria headed inside. We agreed in the past that it would be awkward if she joined me when I went around because I’d be the one doing all the talking and she’d just be standing there. I was only in the parking lot for an hour but I was dripping with sweat. I went inside at 2:25 and met Victoria in section 213 to get game photo number 81. I can’t believe the season is half over! As you can see; I look miserable, or at least my hair does. Even though I had just dried my face off it’s already sweaty again. After getting the game number photo we went back up into the concourse and got some food. I know I had said I would have four or five $1 hot dogs but I did not. I only had two, and we’ll leave it at that. We walked down by section 216, said hi to Bill, then set up shop under the press box for the first two innings. 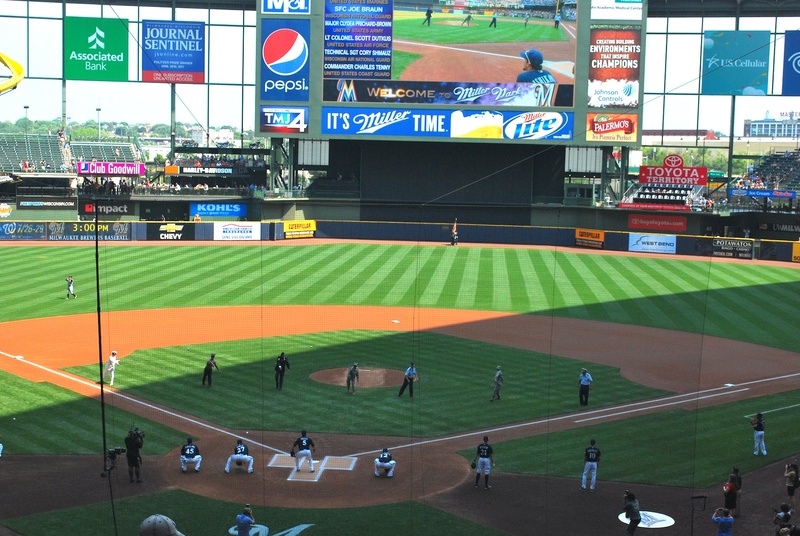 They had retired and active military members throw out first pitches together which I thought was pretty cool. The Marlins took an early lead when Brett Hayes drove in a run on his second-inning single. 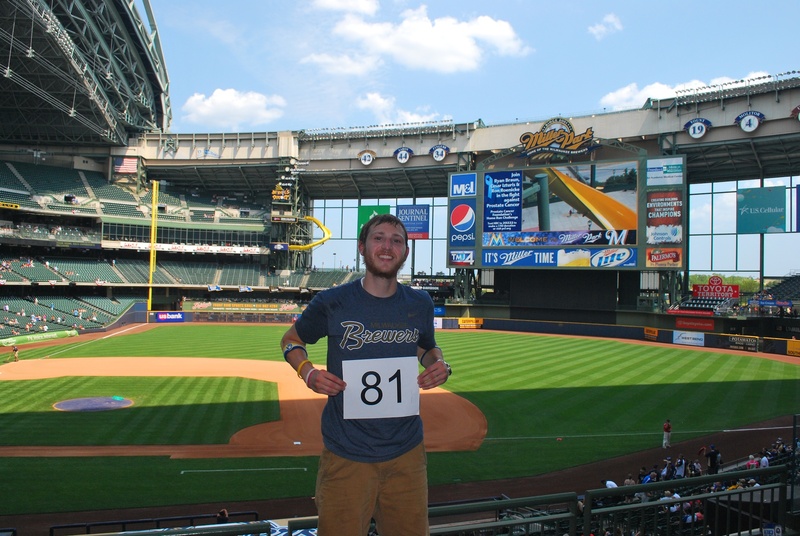 The Brewers again put up a crooked number, this time a 5-spot in the bottom of the second. The Brewers sent 10 batters to the plate in the second and got four singles, three walks, and two groundouts that drove in runs. Five runs without an extra base hit; not the most exciting, but it got the job done. 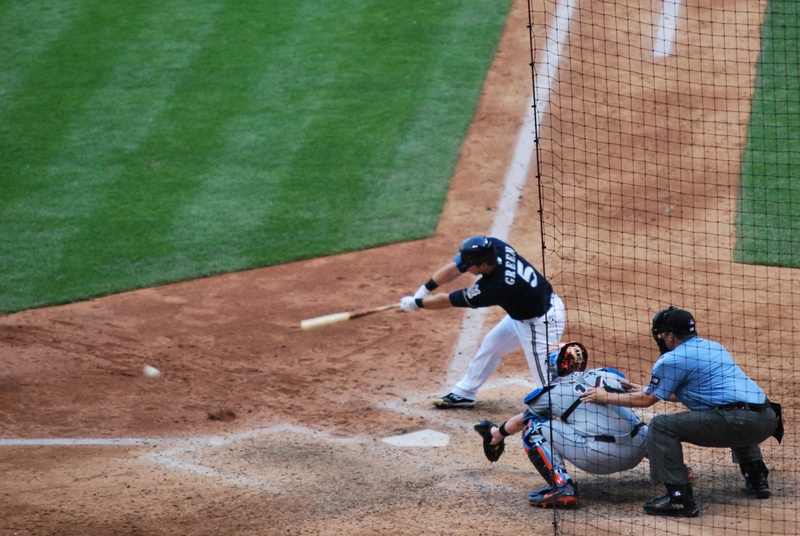 Here’s Braun as he hits one to the first baseman, driving in Randy Wolf in the process. Randy Wolf pitched well early on, and here he is in the third inning, about to let go of a pitch that struck out Jose Reyes. Between the top and bottom of the fifth inning they have the muscle cam at Miller Park, where they show people flexing their guns on the jumbotron. This little guy was up there for 10 seconds or so, and we thought he was really cute. I’m referring to the one in the blue shirt, standing on his mom’s lap. 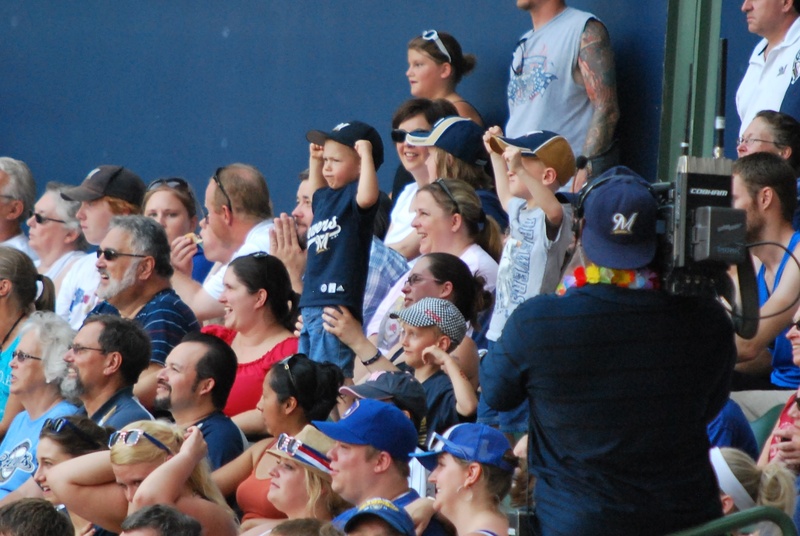 In the same half inning the Brewers show three lucky fans on the scoreboard. 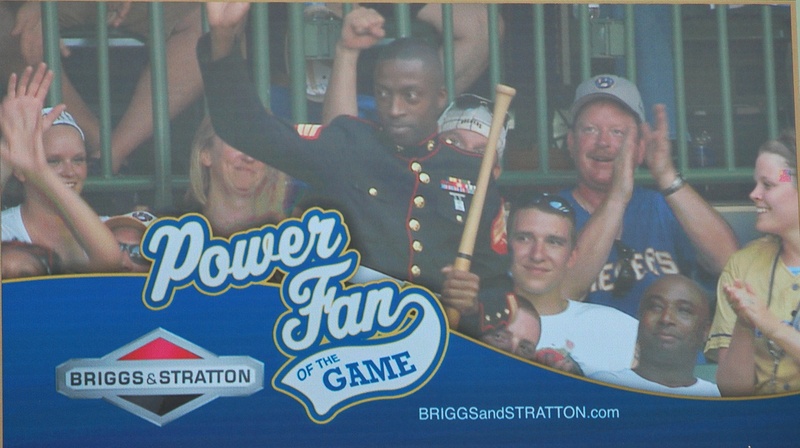 Whoever gets the loudest cheers is chosen as the Briggs and Stratton Power Fan of the Game and awarded a personalized bat in the next half inning. Wednesday they showed two “normal fans” and then showed a marine in uniform. I wonder who won? The other two fans didn’t stand a chance. I mean, who’s going to cheer for anyone else when this guy is serving his country and risking his life? I want to thank all military personnel, past and present, who have served this great Nation. Wolf pitched into the seventh, and maybe it was a little too long. I’m not going to second guess Roenicke like many people around me did. “What an idiot!” was something I heard from a guy behind me. It kind of ticked me off and I actually turned around and said; “Did you see the bullpen yesterday, what do you want him to do?” I don’t know if he responded. Wolf gave up a leadoff home run which cut the lead to 5-2 then with two outs he gave up a three-run home run that tied the game. In the bottom half Aramis Ramirez came through with an RBI single after the Marlins had walked Braun to get to him. 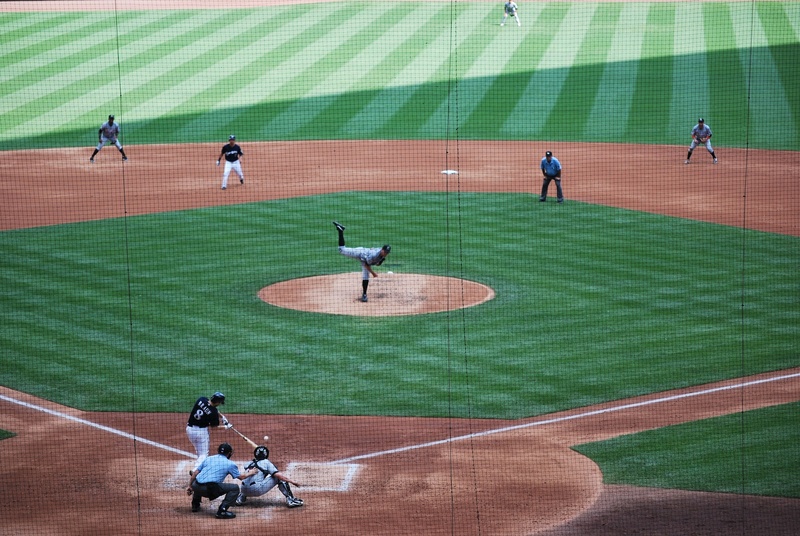 Here’s Ram-Ram shooting one to center to drive in Aoki. And Sanchez gave it a ride to right field for the game-tying home run. Ugh. I don’t know why he didn’t try a curveball on a 1-2 count, and looking at the pitch sequences from the inning he threw 15 fastballs and just one curveball. Maybe he wasn’t feeling it, who knows. The Brewers had two on with two outs in the bottom of the ninth and Ramirez at the plate, who was trying to be the hero once again. 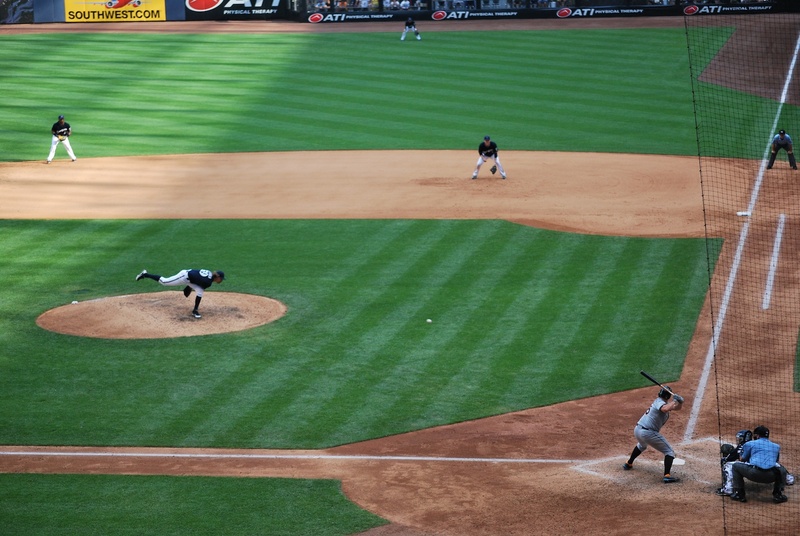 He flied out to shallow right and the game went to extras. 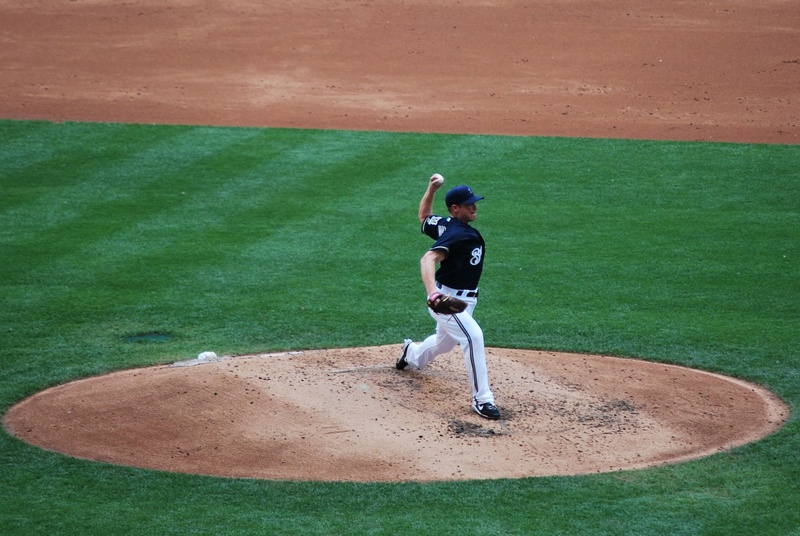 Parra came in and gave up a run in the tenth and the Brewers needed one to tie in the bottom half. Weeks got a hustle double, Maldonado struck out, and Taylor Green stepped to the plate. Heath Bell delivered the 2-2 pitch to Green and he grounded out to end the game. Final Score: Marlins 7 – Brewers 6. The game had started out great and it looked like my wishful writing after Friday’s loss may have helped. I had said that if the Brewers won their last nine games before the break they’d be one game over .500. They were on their way, winning four in a row after I said that, but it wasn’t meant to be. Thursday is going to be another scorcher. 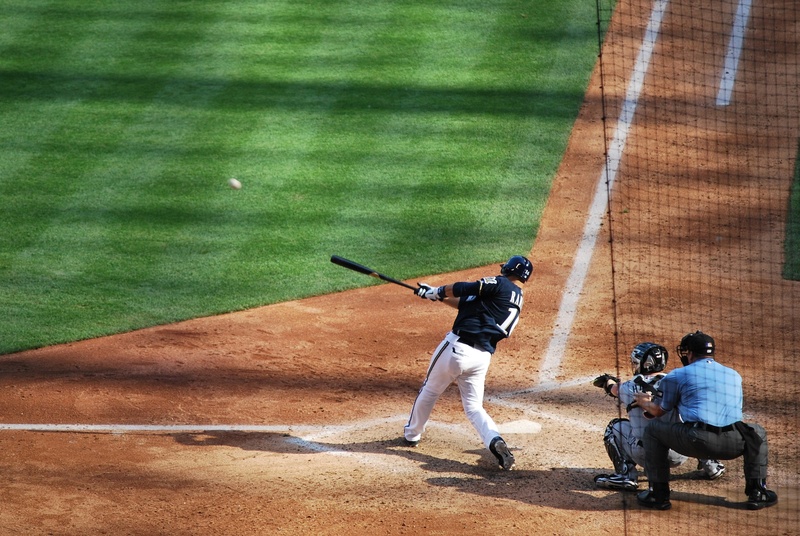 I’m going to the game with Theresa, a former co-worker from Tetra Tech who is a big sports fan. Besides the 100 degree temperatures I’m sure we’ll have a great time.